3. Leave the Type field set to Item and Assign to Preservation Group set to None. Note: These fields are for working with preservation groups. For more information on the Grouping feature see Adding Groups. 4. Indicate the type of preservation being done in the Bid Type field. For more information on bid types, including creating new ones, see Bid Types. 9. Select a status for the preservation from the Initial Status field. For information on creating additional Preservation statuses, see Statuses>Preservation. 12. If you have created any preservation auto tasks and you do not wish for them to generate for this particular item, click the Disable Auto Tasks checkbox. 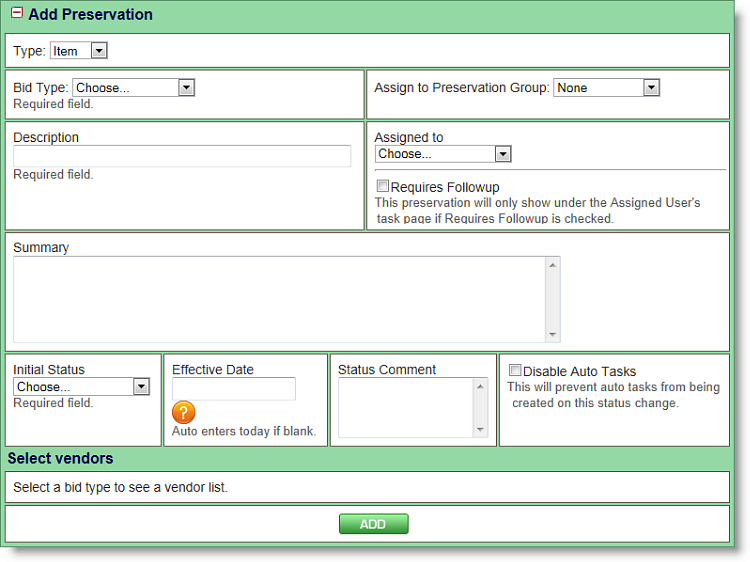 See Preservation Auto Tasks for more information on the auto tasking feature. 13. 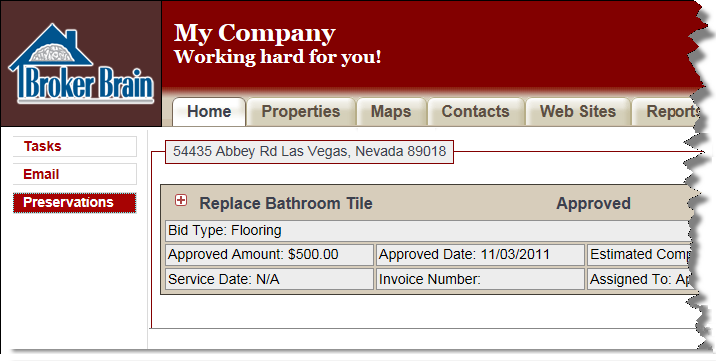 In the Select Vendors field, click the checkbox next to each vendor that is submitting a preservation bid. Note: The vendor list is related to the Bid Type. Selecting a new Bid Type will generate a different list of vendors. 14. Click the Add button to add the preservation. Your preservation will appear in the Items section of the screen.